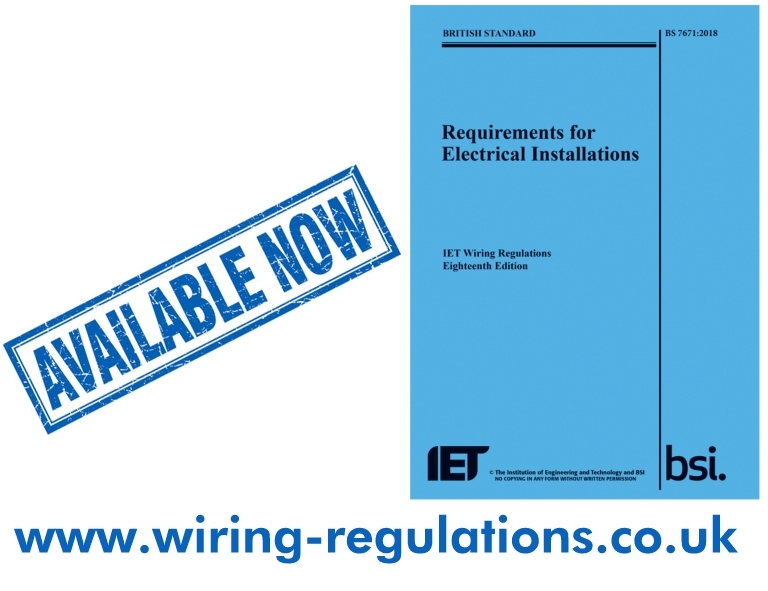 The following list provides an overview of the main changes within the 18th Edition IET Wiring Regulations (publishing 2nd July 2018). 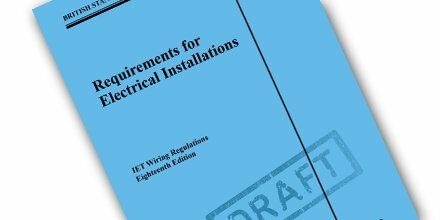 This list is not exhaustive as there are many smaller changes throughout the book not included here.BS 7671:2018 Requirements for Electrical Installations will be issued on 2nd July 2018 and is intended to come into effect on 1st January 2019. Installations designed after 31st December 2018 will have to comply with BS 7671:2018. The Regulations apply to the design, erection and verification of electrical installations, also additions and alterations to existing installations. Existing installations that have been installed in accordance with earlier editions of the Regulations may not comply with this edition in every respect. This does not necessarily mean that they are unsafe for continued use or require upgrading. A summary of the main changes is given below. (This is not an exhaustive list). Regulation 133.1.3 (Selection of equipment) has been modified and now requires a statement on the Electrical Installation Certificate. Definitions have been expanded and modified. Metallic pipes entering the building having an insulating section at their point of entry need not be connected to the protective equipotential bonding (Regulation 411.3.1.2). 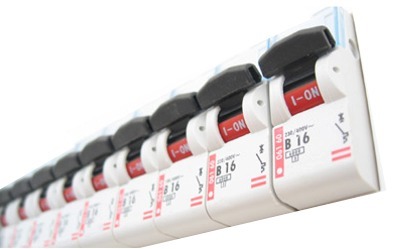 The maximum disconnection times stated in Table 41.1 now apply for final circuits up to 63 A with one or more socket-outlets and 32 A for final circuits supplying only fixed connected current-using equipment (Regulation 411.3.2.2). Regulation 411.3.3 has been revised and now applies to socket-outlets with a rated current not exceeding 32A. There is an exception to omit RCD protection where, other than a dwelling, a documented risk assessment determines that RCD protection is not necessary. A new Regulation 411.3.4 requires that, within domestic (household) premises, additional protection by an RCD with a rated residual operating current not exceeding 30 mA shall be provided for AC final circuits supplying luminaires. Regulation 411.4.3 has been modified to include that no switching or isolating device shall be inserted in a PEN conductor. Regulations 411.4.4 and 411.4.5 have been redrafted. The regulations concerning IT systems (411.6) have been reorganized. Regulations 411.6.3.1 and 411.6.3.2 have been deleted and 411.6.4 redrafted and a new Regulation 411.6.5 inserted. A new Regulation group (419) has been inserted where automatic disconnection according to Regulation 411.3.2 is not feasible, such as electronic equipment with limited short-circuit current. A new Regulation 421.1.7 has been introduced recommending the installation of arc fault detection devices (AFDDs) to mitigate the risk of fire in AC final circuits of a fixed installation due to the effects of arc fault currents. Regulation 422.2.1 has been redrafted. Reference to conditions BD2, BD3 and BD4 has been deleted. A note has been added stating that cables need to satisfy the requirements of the CPR in respect of their reaction to fire and making reference to Appendix 2, item 17. Requirements have also been included for cables that are supplying safety circuits. Section 443, which deals with protection against overvoltages of atmospheric origin or due to switching, has been redrafted. (d) affects a large number of co-located individuals. For all other cases, a risk assessment has to be performed in order to determine if protection against transient overvoltage is required. There is an exception not to provide protection for single dwelling units in certain situations. Chapter 46 Devices for isolation and switching – A new Chapter 46 has been introduced. This deals with non-automatic local and remote isolation and switching measures for the prevention or removal of dangers associated with electrical installations or electrically powered equipment. Also, switching for the control of circuits or equipment. Where electrically powered equipment is within the scope of BS EN 60204, only the requirements of that standard apply. Regulation 521.11.201 which give requirements for the methods of support of wiring systems in escape routes, has been replaced by a new Regulation 521.10.202. This is a significant change. Regulation 521.10.202 requires cables to be adequately supported against their premature collapse in the event of a fire. This applies throughout the installation and not just in escape routes. Regulation 522.8.10 concerning buried cables has been modified to include an exception for SELV cables. Regulation 527.1.3 has also been modified, and a note added stating that cables also need to satisfy the requirements of the CPR in respect of their reaction to fire. This chapter has been completely revised and deals with general requirements for protection, isolation, switching, control and monitoring and with the requirements for selection and erection of the devices provided to fulfil such functions. This section focuses mainly on the requirements for the selection and erection of SPDs for protection against transient overvoltages where required by Section 443, the BS EN 62305 series, or as otherwise stated. Section 534 has been completely revised and the most significant technical change refers to the selection requirements for the voltage protection level. Two new regulations (542.2.3 and 542.2.8) have been introduced concerning earth electrodes. Two further new regulations (543.3.3.101 and 543.3.3.102) have been introduced. These give requirements for the insertion of a switching device in a protective conductor, the latter regulation relating to situations where an installation is supplied from more than one source of energy. Regulation 550.1 introduces a new scope. New Regulation 559.10 refers to ground-recessed luminaires, the selection and erection of which shall take account of the guidance given in Table A.1 of BS EN 60598-2-13. Part 6 has been completely restructured, including the regulation numbering to align with the CENELEC standard. Chapters 61, 62 and 63 have been deleted and the content of these chapters now form two new Chapters 64 and 65. This section contains a number of small changes, including requirements for external influences (Regulation 704.512.2), and a modification to Regulation 704.410.3.6 concerning the protective measure of electrical separation. This section contains a number of changes including requirements for socket-outlets, RCD protection, and operational conditions and external influences. This section contains a number of small changes including the removal of Table 710. Changes to Regulations 710.415.2.1 and 710.415.2.3 concerning equipotential bonding. A new Regulation 710.421.1.201 which states for all final circuits supplied by medical IT system in medical locations of group 2, AFDD shall not be used. This section contains only minor changes including modifications to Regulation 715.524.201. This section contains a number of changes including requirements electrical separation, RCDs, proximity to non-electrical services and protective bonding conductors. This section contains significant changes to Regulation 722.411.4.1 concerning the use of a PME supply. The exception concerning reasonably practicable has been deleted. Changes have also been made to requirements for external influences, RCDs, socket-outlets and connectors. This is an entirely new section and applies to onshore installations dedicated to the supply of inland navigation vessels for commercial and administrative purposes, berthed in ports and berths. Most, if not all, of the measures used to reduce the risks in marinas apply equally to electrical shore connections for inland navigation vessels. One of the major differences between supplies to vessels in a typical marina and electrical shore connections for inland navigation vessels is the size of the supply needed. This section has been completely revised. The scope of Section 753 has been extended to apply to embedded electric heating systems for surface heating. The requirements also apply to electric heating systems for de-icing or frost prevention or similar applications, and cover both indoor and outdoor systems. Heating systems for industrial and commercial applications complying with IEC 60519, IEC 62395 and IEC 60079 are not covered. Appendix 1 British Standards to which reference is made in the Regulations includes minor changes, and additions. This appendix includes minor changes to the certificates, changes to the inspections (for new installation work only) for domestic and similar premises with up to 100 A supply, and examples of items requiring inspection for an electrical installation condition report. This appendix includes only minor changes. This appendix includes changes regarding rating factors for current-carrying capacity. Appendix 3. Appendix 14 now contains information on determination of prospective fault current. This is a new appendix that provides recommendations for the design and erection of electrical installations including installations having local production and storage of energy for optimizing the overall efficient use of electricity. The recommendations within the scope of this appendix apply for new electrical installations and modification of existing electrical installations. Much of this appendix will not apply to domestic and similar installations. This entry was posted in 18th Edition Regulations and tagged 18th Edition Wiring Regulations, BS 7671:2018, IET on 29th June 2018 by admin. The May 2018 edition of the IET Wiring Matters magazine is out now ! Lets take a look at what’s in this issue. Electrical installation work is no stranger to the ‘we’ve always done it this way…..’ attitude which is often applied with little thought. This occasional column, by James Eade, intends to expose electrical myths and folklore that still abound in the industry and, where possible, to examine their origin. An interview Leon Markwell about his role within the IET, the committees he sits on and his career in the industry. We all understand how integral BS 7671 is to the electrical engineering industry, but have you ever wondered how other Standards within the sector come to fruition? In this article, Emma Chafer, takes a look at how you can get involved in setting standards that will enhance engineering. This entry was posted in Industry News and tagged IET, Wiring Matters on 13th May 2018 by admin. Poor electrical safety can be lethal! You could be looking at extensive litigation, huge fines and even prosecution if a workplace electrical incident is shown to have been preventable. This two-day course based on the IET’s Code of Practice for Electrical Safety Management provides a comprehensive guide to the fundamentals of electrical safety and a systematic set of principles for assessing and managing electrical safety relevant to any business, sector and country. This entry was posted in Event News and tagged Electrical Safety Management, IET on 22nd April 2018 by admin. The March 2018 edition of Wiring Matters Magazine is out now, lets take a quick look at what’s inside this issue. IET are launching a new Electrical site, which is mobile responsive, will offer an easier subscriptions process to Wiring Matters magazine, and will be much easier to navigate. The website is due to launch by the end of this month. In the meantime, you might see some changes on a few pages, such as the Shop – which, in early March, will be updated with 18th Edition books ready for you to pre-order. Adam Fernandes, from UHY Hacker Young, provides advice about how to manage the accounting for your business ahead of the new tax year. Have you found yourself in the middle of a complex supply chain? Have you paid out on materials and labour costs and are yet to receive your initial deposit or valuation payment? When you are suffering from negative cash flow, situations like the above can take down even the most profitable of construction businesses and this is why cash flow is so important. Wiring Matters interviews Allan Burns, the author of the IET’s Guide to Smart Homes for Electricians. In October 2016, IET published Code of Practice for Connected Systems Integration in Buildings. They are continuing to see a lot of interest around smart homes and the connected systems that are required to make a smart home work. However, despite the interest, there seems to be a lack of confidence in how to go about implementing such connected systems. More detail’s on all of this month’s story’s can be found here. This entry was posted in Industry News and tagged Allan Burns, IET, Smart Homes, Wiring Matters on 11th March 2018 by admin.